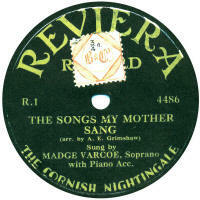 British 78rpm record labels whose name begins with R. Using the letter links below you can see pages for other letters. Rabbit These were made for export to Thailand. This rather fuzzy example was made in England, hence its inclusion here, but another example I have seen was made in India. Both examples were recorded & made by EMI. Rach-o-phone A scarce pre-WWI record manufactured in Germany and sold in Britain. 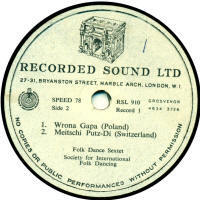 They were sold by Israel Rachovitch of Whitechapel, East London, hence the label's name and the initials I.R. on the book motif on the label. They were made available from November 1912, and must have stopped by August 1914 on the outbreak of WWI, but they may have stopped well before then, judging by their rarity. 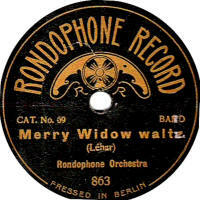 Rach-o-Phone records were manufactured in Germany by Kalliope, using "Blum" masters (also to be found on Diploma, Pioneer, Stella, Victory etc). 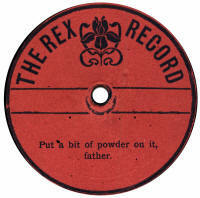 Radiex Radiex records were a product of the Grey Gull company of Boston, Mass, USA, from the early 1920s until 1930 when the company went out of business. However, in the late 1920s many Grey Gull products were shipped over to Britain, judging by the appearance of UK publisher's copyright stamps on the labels. In fact, it is possible they were shipped over after the parent Grey Gull company went bankrunpt in 1930. The copyright stamp value of 1d on the Radiex records implies these records were about 2/6 in price, which was quite expensive for what was in fact a cheap record. I haven't yet found out who sold them in Britain. 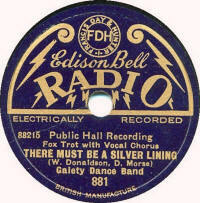 (Edison Bell Radio) Edison Bell's entry into the lucrative 8" disc market came in 1928 with Radio records. 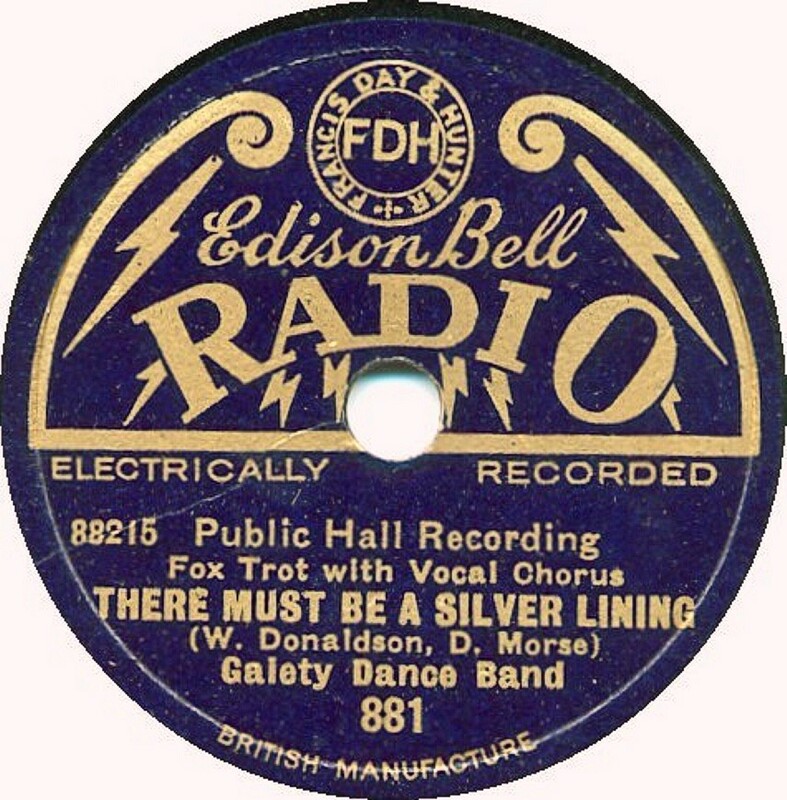 The first issues made no mention of "Edison Bell" on the label. The records were described on the sleeves as "The Big 8" and cost 1/3. It was a high-quality product aimed at the popular market. 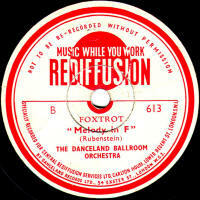 Ex-music hall artist, Harry Hudson, was musical director and provided most of the dance music under a variety of pseudonyms. In 1931, the gold-on-blue colour scheme was almost reversed and it became black-on-gold, but time was running out and the label ceased production in 1932. The catalogue numbers started at 800 and reached just over 1600 at the end, though 1000-1200 weren't used (at least in Britain). 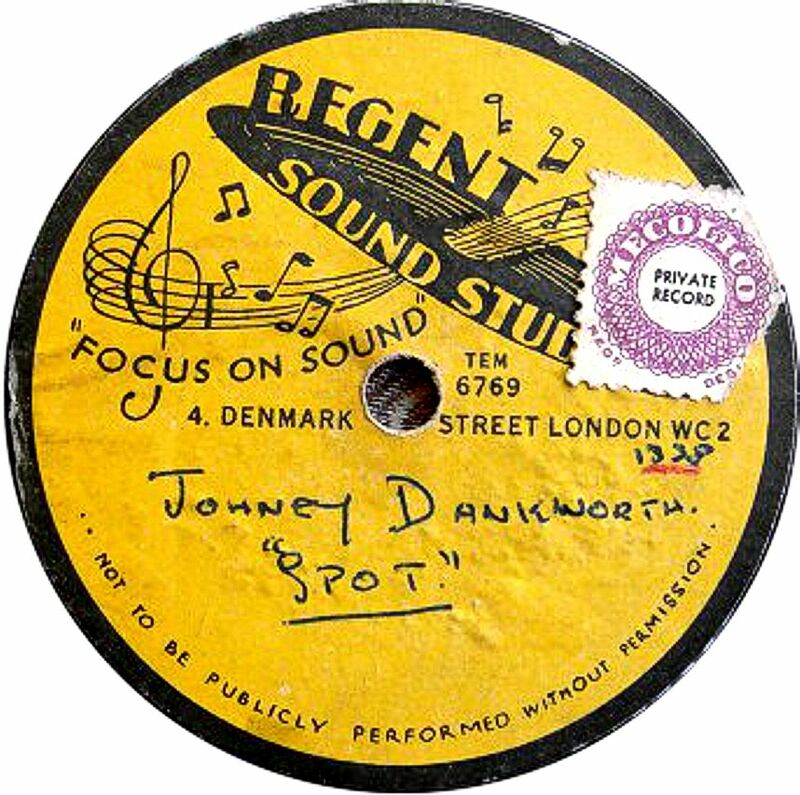 Continental series usually had a prefix and were printed with a dark blue-on-violet label with the same design as the usual British ones. 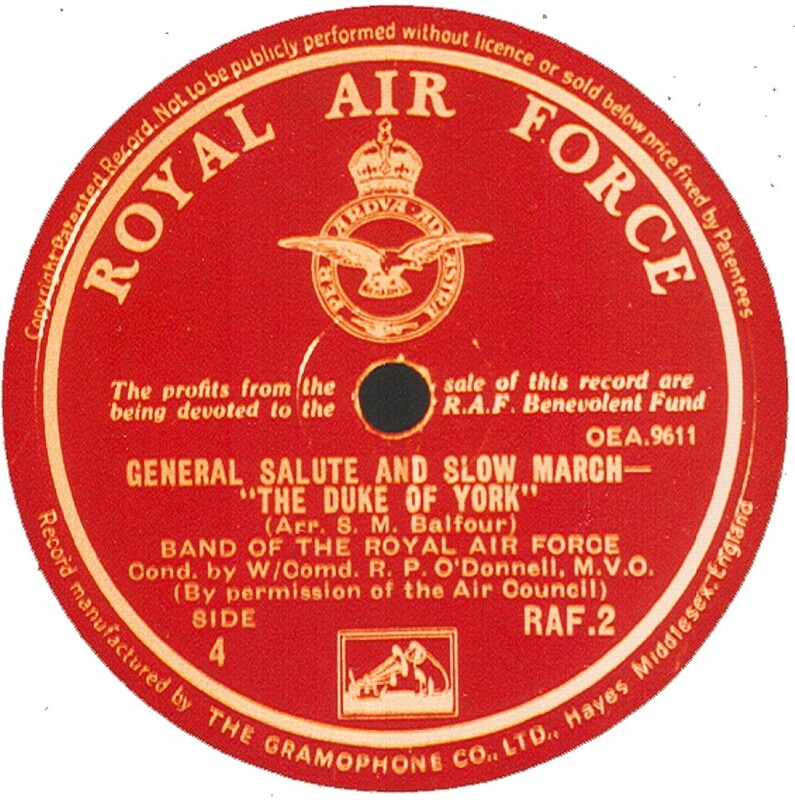 All were recorded and made in Britain. Matrix numbers were in an 80000-series. 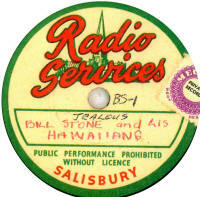 Radio Services Thanks to Bill-Dean-Myatt for the label image. 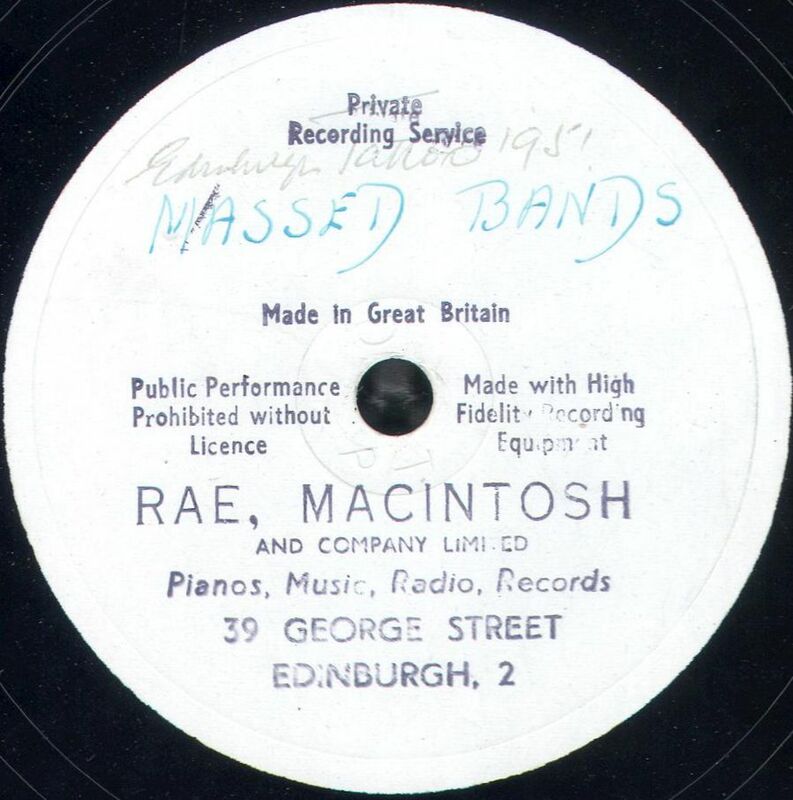 Rae MacIntosh This was a recording company based at 39, George Street, Edinburgh after WWII. 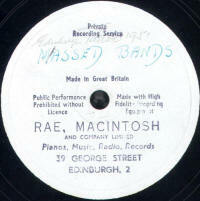 It is not believed they issued records commercially, but were basically maklin private recordings. The first image here is one of a set of 10" & 12" specially arranged recordings taken by EMI by permission of the Governor of Edinburgh Castle as a fundraiser. 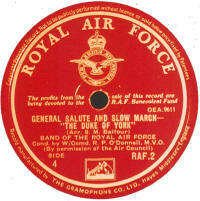 The records have EMI (HMV) masters in the 0EB and 2EB series and date from 1950. Thanks to Bill-Dean-Myatt for the label images. 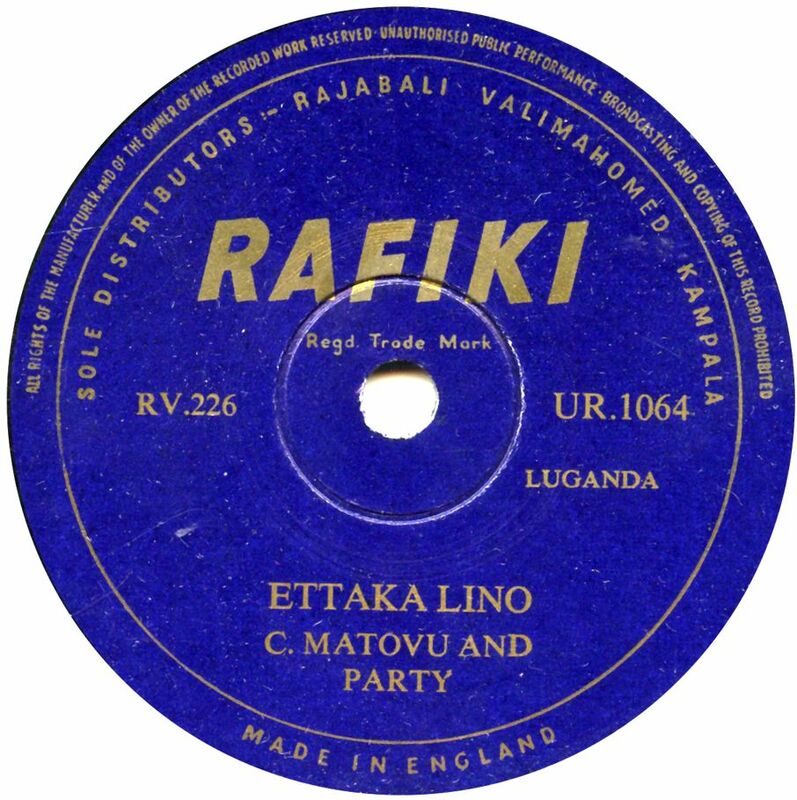 Rafiki Thanks to Bill-Dean-Myatt for the label image. 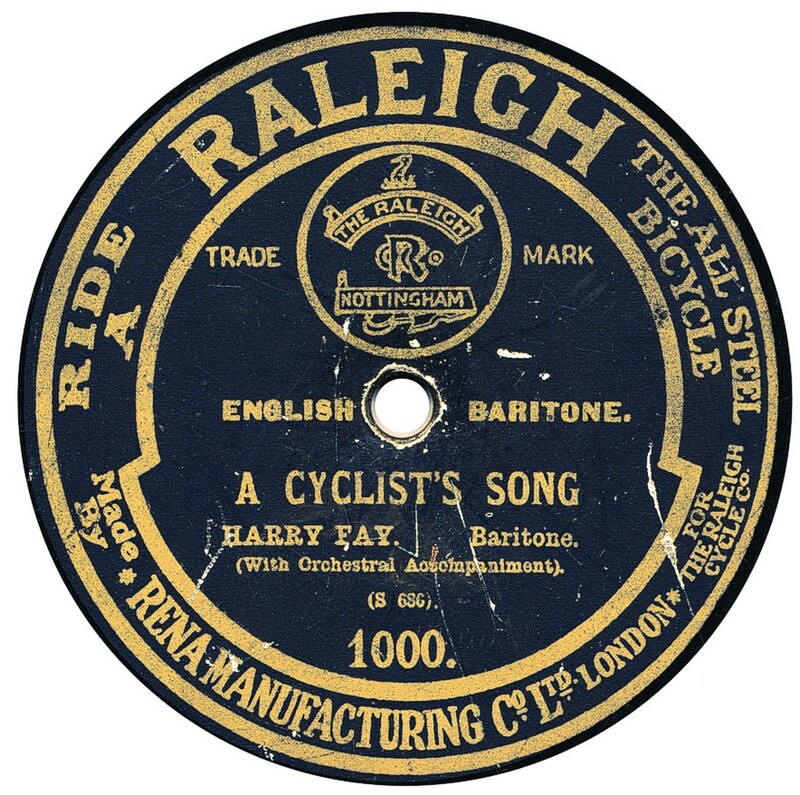 Raleigh A pair of records produced for the cycle manufacturing company of the same name, of Nottingham, dating from 1909 & 1910. Columbia manufactured them for Rena Records. They are numbered 999 and 1000. 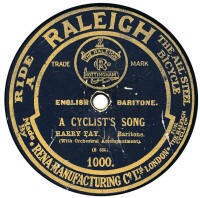 One side of each was by comedian Harry Fay, specifically recorded for these issues, and they are coupled with existing band recordings. 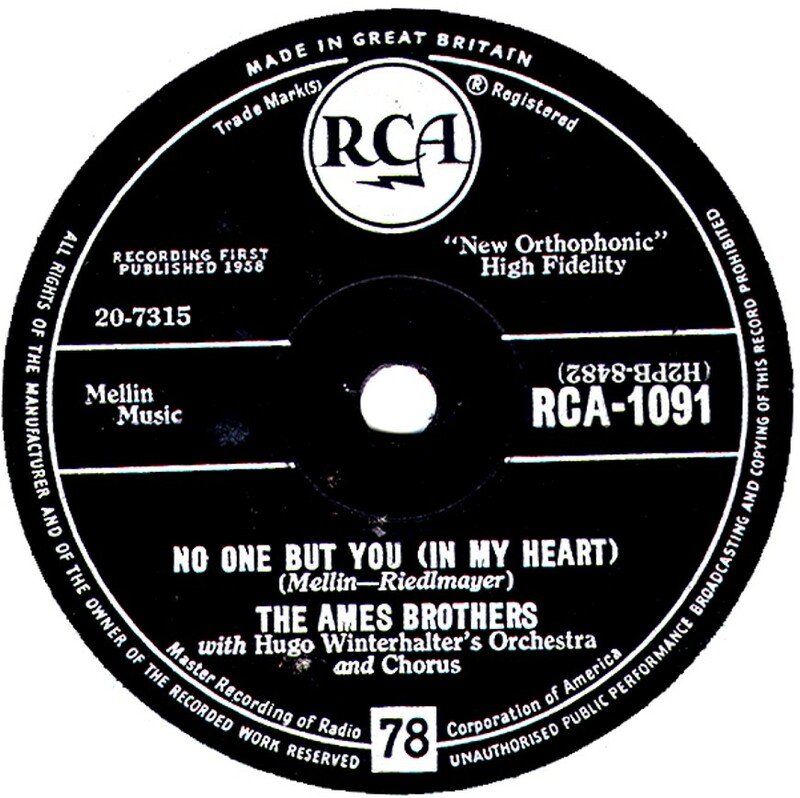 RCA In 1957, the commercial relationship between EMI in th UK and RCA Victor in the US broke down and as a result RCA launched RCA records in Britain. 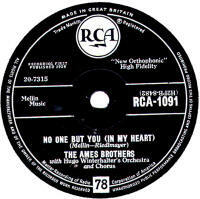 The records were made by Decca and all recordings were American, from RCA Victor. 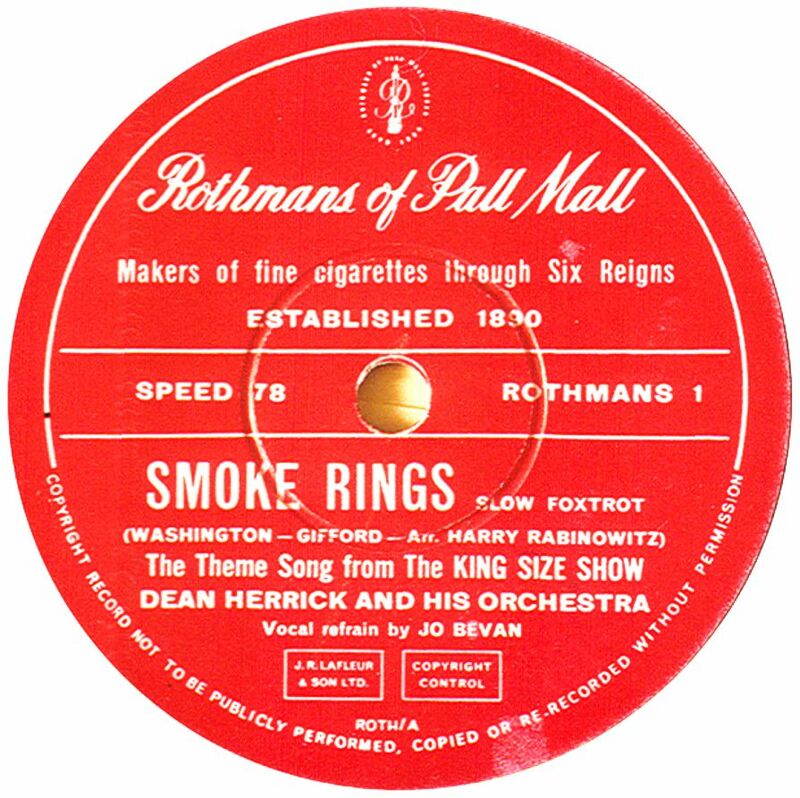 The 78rpm records were produced until April 1962. Thanks to Bill-Dean-Myatt for the label image. Record Tutors Does anyone have any ideas about this record? 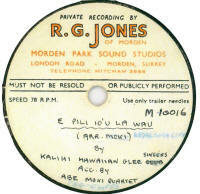 The label gives no clues as to who made the record, or when or where. The matrix numbers (in the wax only) are hand-scribed and are RJG-1 and RJG-2. Thanks to Richard Prout for the label image. 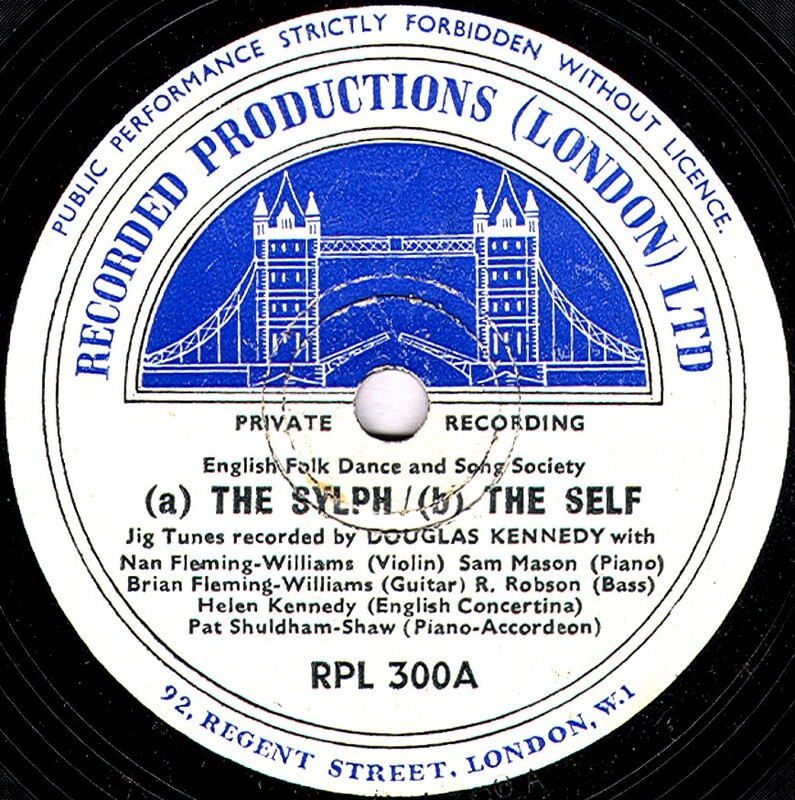 Recorded Productions A record company based in London's West End, they started making recordings in 1948 and continued in the 78rpm style until the end of the 1950s or possibly into 1960. 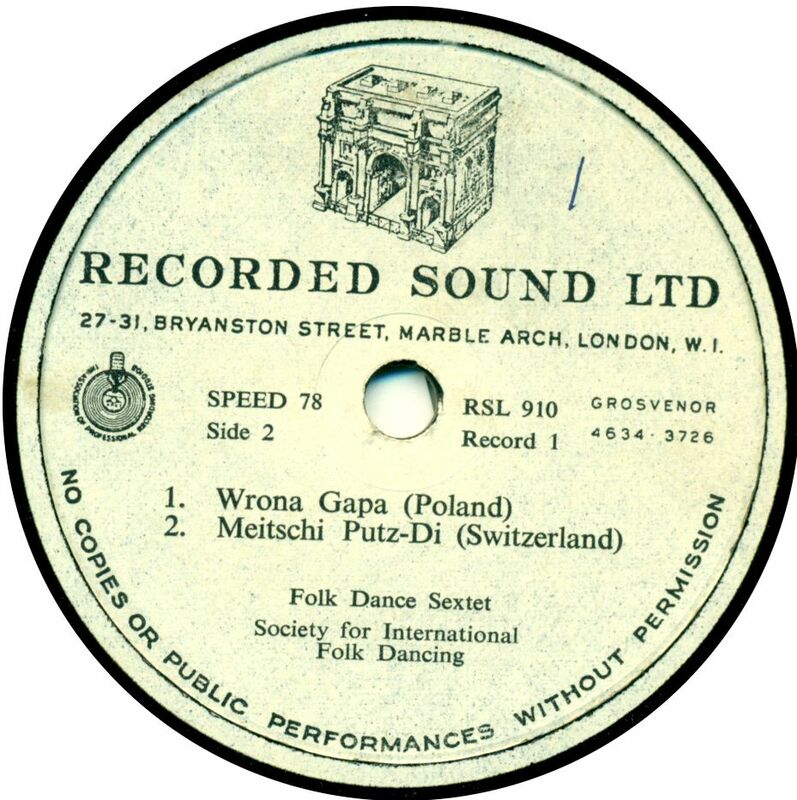 It would seem they initially made recordings for The English Folk Dance & Song Society, issued on their own-named label but later made recording issued on other post-WWII labels, including Herald and London Jazz. 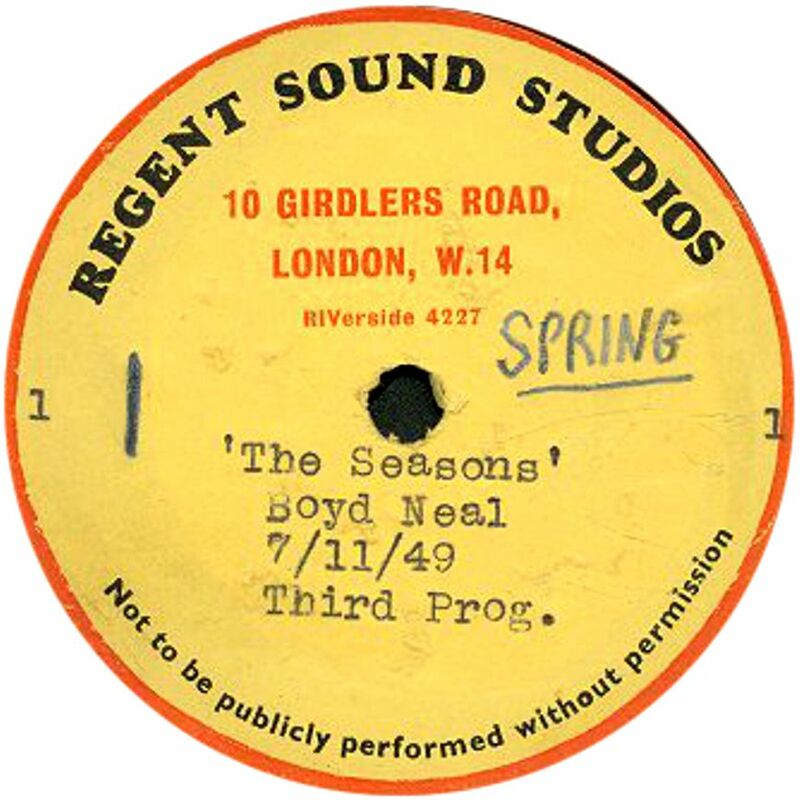 Recorded Sound A "Local" record company based in London's West End, registered in 1946 and making recordings until at least the mid-1950s. They were not linked with Recorded Producions (see above) but operated in a similar market; that of makling private recordings for limited distribution. Their matrix n=umbers had RSL prefixes. Records Ltd Even Frank Andrews can throw little light on this record company or its records. 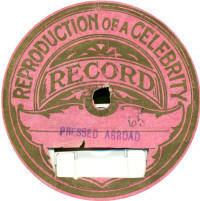 Image from "For The Record" No. 43. 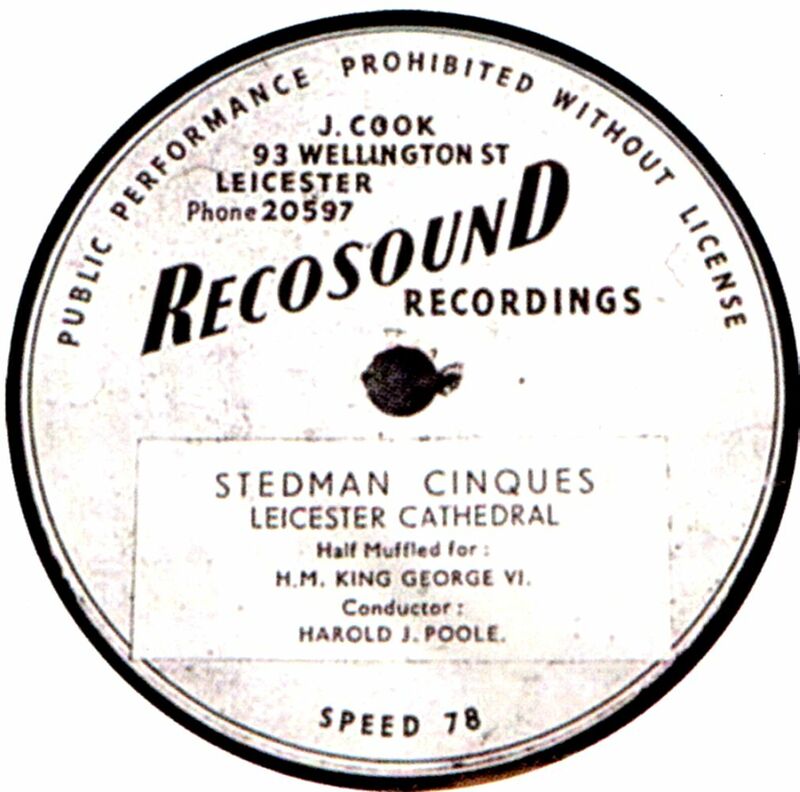 Recosound This was a private recording company based in Leicester. 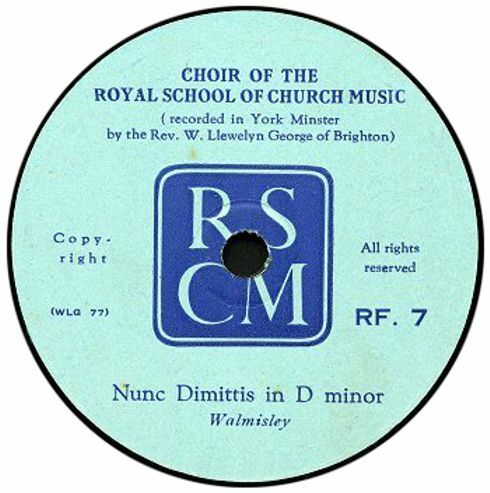 Known records have no catalogue numbers and are mainly of choirs and bell-ringing, dating from post-WWII. 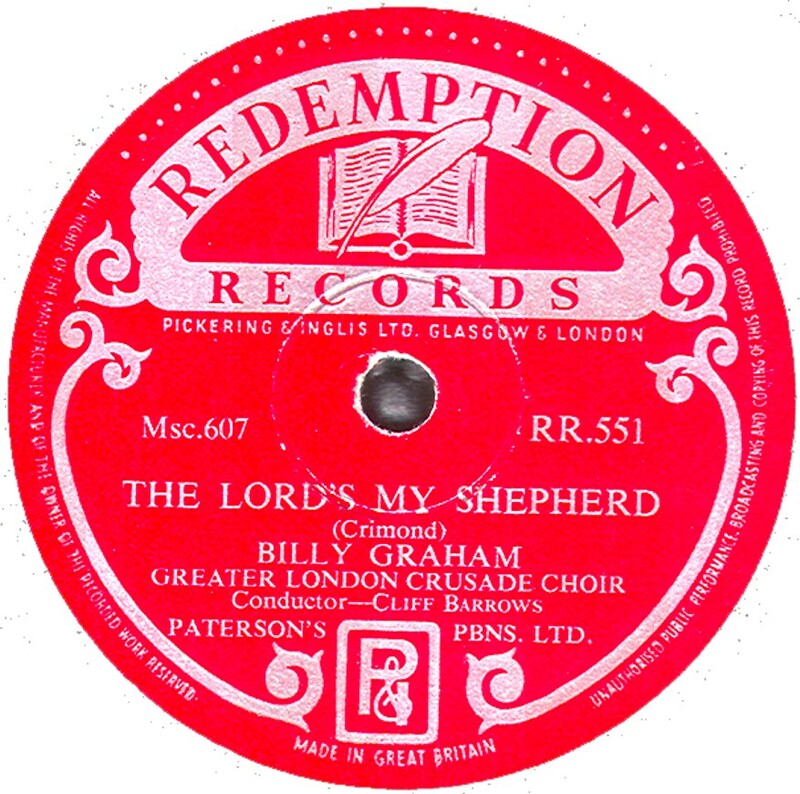 Redemption Dating from after WWII, these records were made by Decca and the owner of the label was Pickering & Inglis Ltd of Grasgow & London. 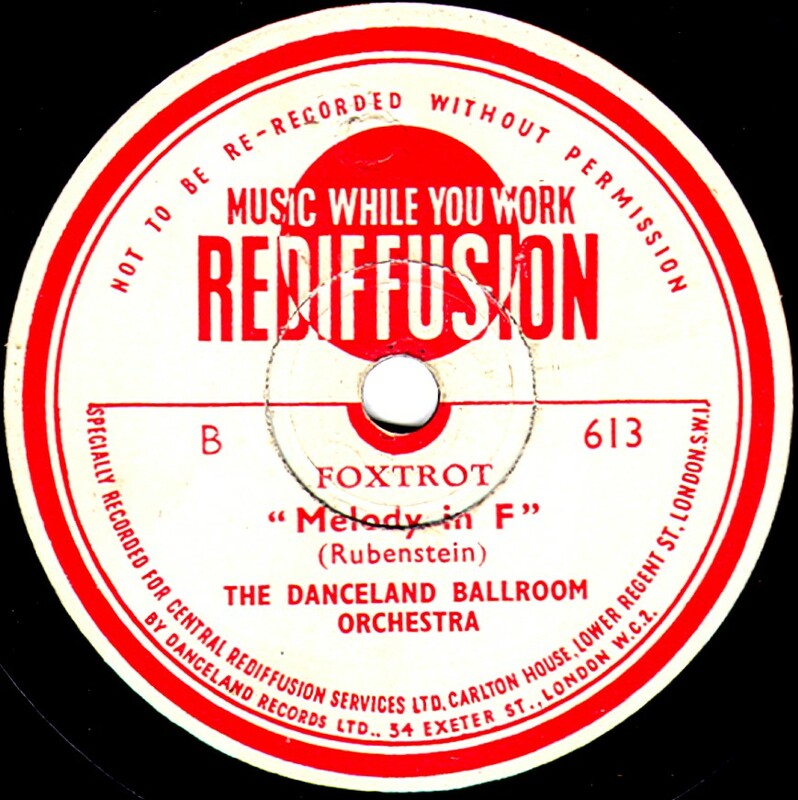 Rediffusion These appear to be reissues of Danceland records, and date to the early 1950s. 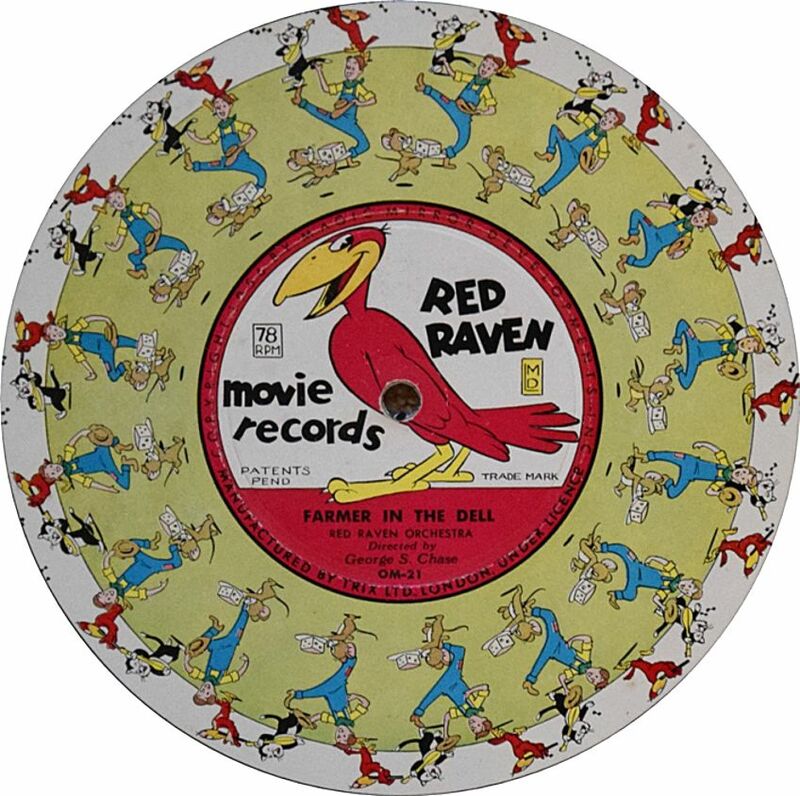 Red Raven This is an 8½" record, obviously made for children. 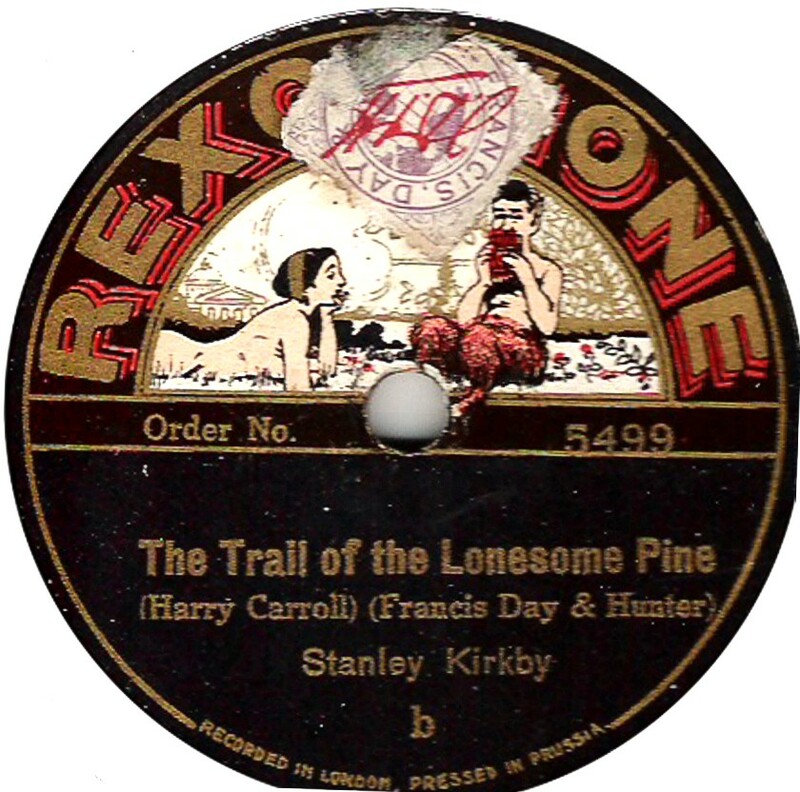 The recordings are American, but the record was manufactured (under licence) in England by Trix of London. According to the late Eddie Shaw, these were sold inthe USA between 1956 and 1961, so it is likely the British ones date from a similar period. 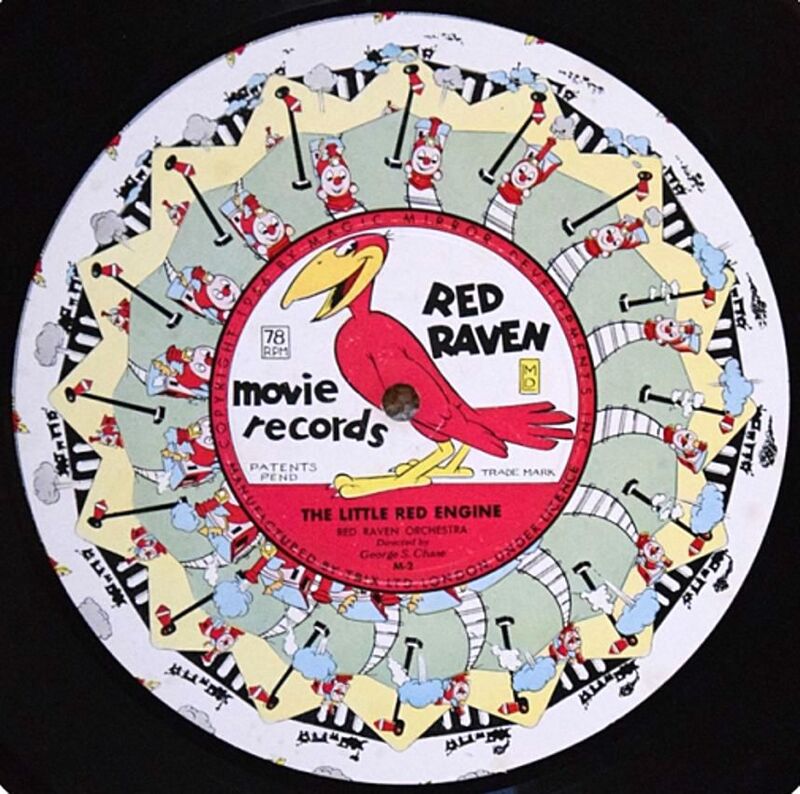 According to Kurt Nauck, who recently (2017) auctioned 19 of the U.S versions, the records were "designed to be played with the Red Raven Magic Mirror. Technically termed a 'praxinoscope', this device resembles a small carousel. It is placed over the turntable spindle on top of the record. As the record plays, a series of pictures on the record become animated as they are individually reflected in the panes of the Magic Mirror." Thanks to Richard Prout for the label images, and information. Information of any further UK manufactured examples would be gratefully received. Redwing A pretty obscure label, Redwing was produced by British Homophone using matrices also issued on Sterno. The trade mark was registered in January 1933 by Gallaghers Ltd, the Belfast cigarette manufacturer. It has not been found who sold the records, maybe they were exchanged for cigarette coupons? 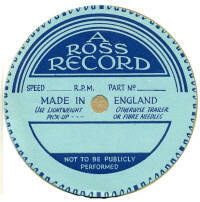 From the "Public Performance is forbidden" wording around the foot of the label, the records must date from after March 1934. The catalogue numbers started at R-1000, and the highest traced and shown in my listing is R-1023. 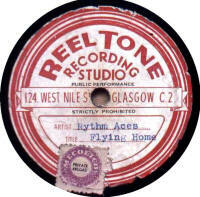 Reeltone The Reeltone Recording Studio was a private recording company based in Glasgow. Known examples are lacquer discs ("acetates") and date from post WWII. 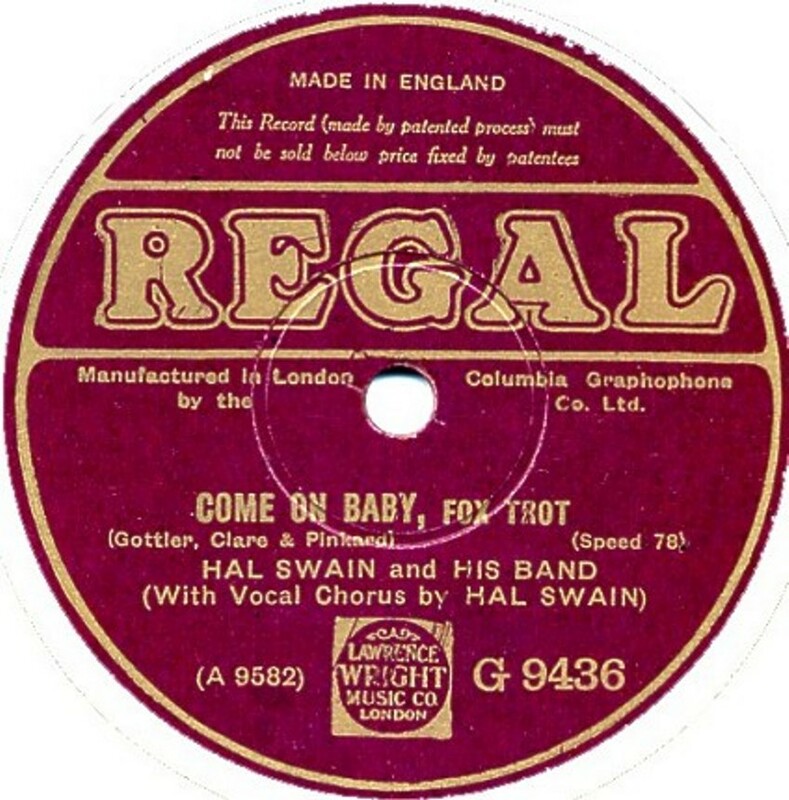 Regal Regal started as a budget product made by Columbia Records and introduced in early 1914 costing 1/6, rising to 3/- in 1918, before falling to 2/6 in September 1921. It remained at this price until 1931 when it reverted to 1/6. The label colour was initially red, changing to magenta fairly early on. The catalogue series started in a G-6000 range, reaching G-9473 before changing to MR-1 in 1930. A few 12" Regals were issued in a G-1000 series and later in an MX- series. 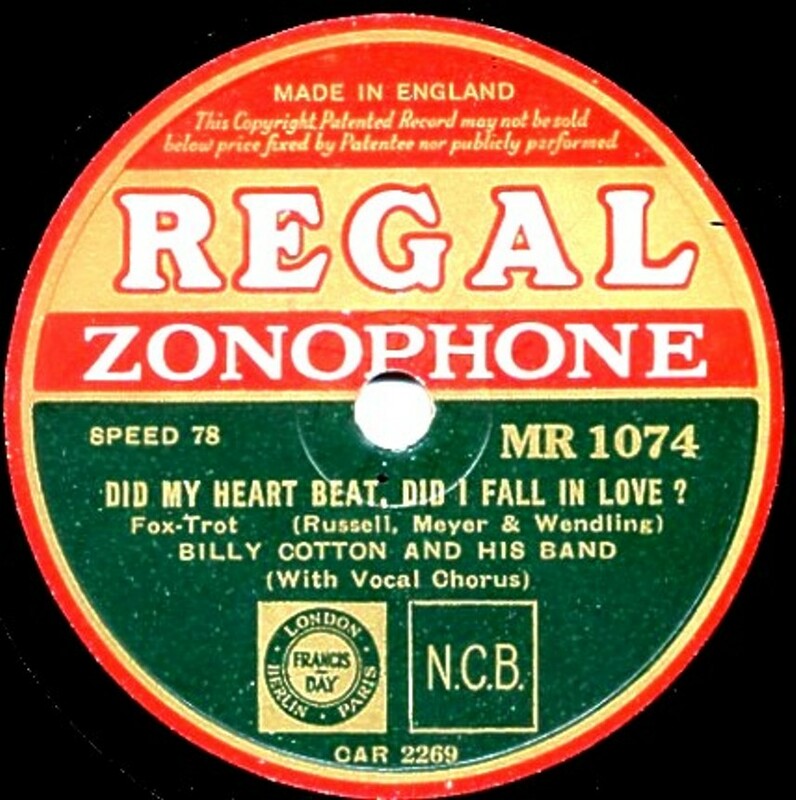 The label was taken over by EMI in 1932 as part of their purchase of Columbia, when they merged the two cheaper labels of Regal and Zonophone (see below), by which time the numbering had reached MR-744. A complete listing of Regal issues has been published by the CLPGS. 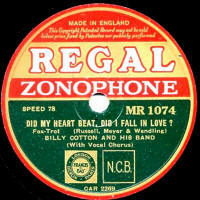 Regal Zonophone Regal Zonophone was the result of EMI's amalgamation of Columbia's "Regal" and the Gramophone Company's "Zonophone" labels in January 1933. following the forming of EMI, at which time the catalogue numbering was at MR-745. Initially there was a mixture of the last few Zonophone masters (in an 0Y-series), but generally the CAR-series which started under Columbia's ownership was used right up until the label's demise in November 1949, by which time the catalogue numbers had reached MR-3819. Many American masters were used, initially from US Columbia, but later from Bluebird. Initially the label was a rather bright green and red, but subsequently the green was darkened (see example) and it was a very attractive label. In February 1935, the price was reduced to 1/- and the colour changed to just plain red with gold printing. As is usual with red labels, the gold printing was apt to wear off. The price increased to 1/3 in March 1937 then back up to 1/6 in September 1937. 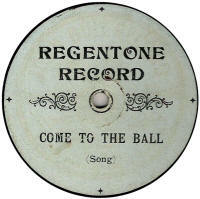 Regent Dating from the early 1920s, Regent issued 6 records with a catalogue number range from PC-1 to PC-6. 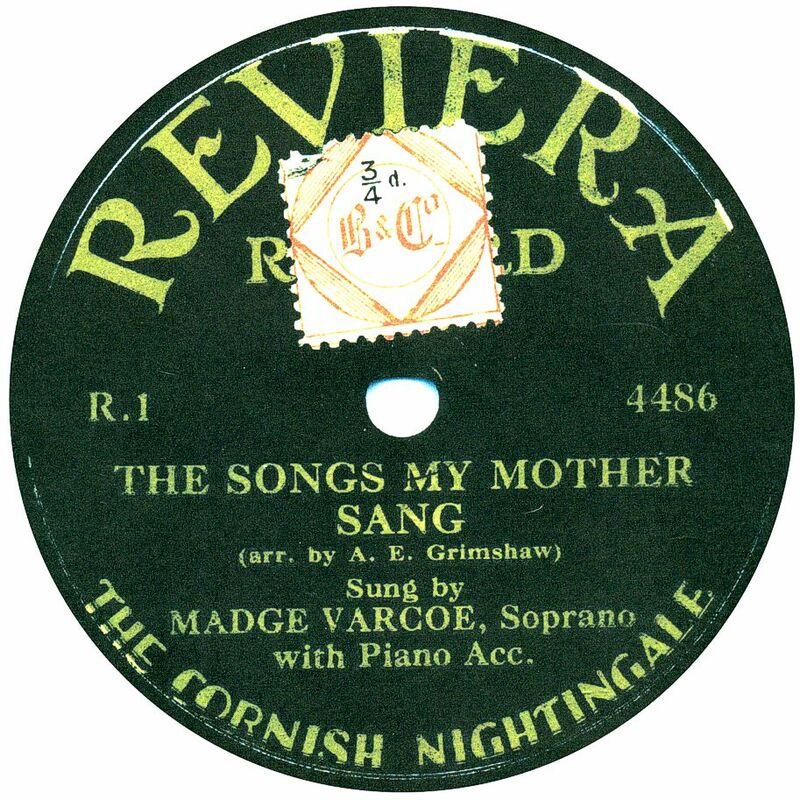 All the recordings were made by Columbia and were of the Brighton Regent Orchestra (of the Regent Theatre in Brighton) under the direction of Basil Cameron; the recordings date from June 14th & June 15th 1922; Nine or 10 of the sides were also issued on Regal, as Regal (Dance) Orchestra. 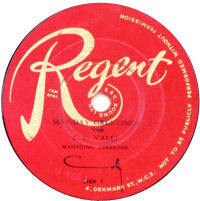 Regent Sound Ltd A private recording studio based in Denmark Street London, Regent records can be found both as bespoke issued, like the first image, or as properly pressed commercial (or maybe semi-commercial) issues (see second image). Thanks to Bill-Dean-Myatt for the first label image. Regent Sound Studioss Regent Sound Studios, based at Girdlers Roads, London, was another private recording concern, but not affiliated to "Regent", above. 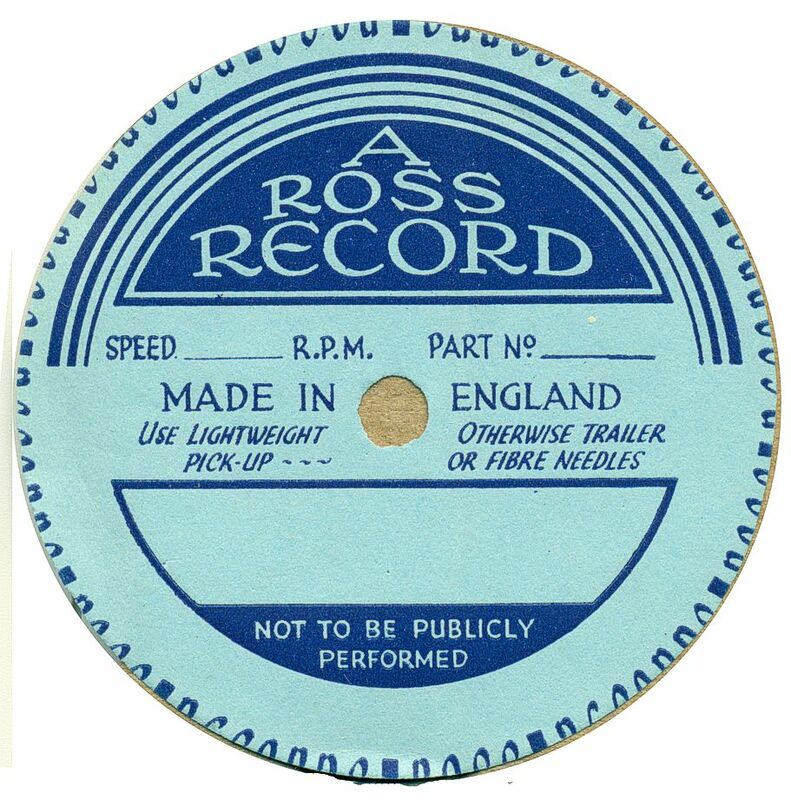 As with many of these companbies, they would make one-off recordings, usually on lacquer discs, but wouldarrange to have records pressed up in shellac or vinyl if the numbers required it. 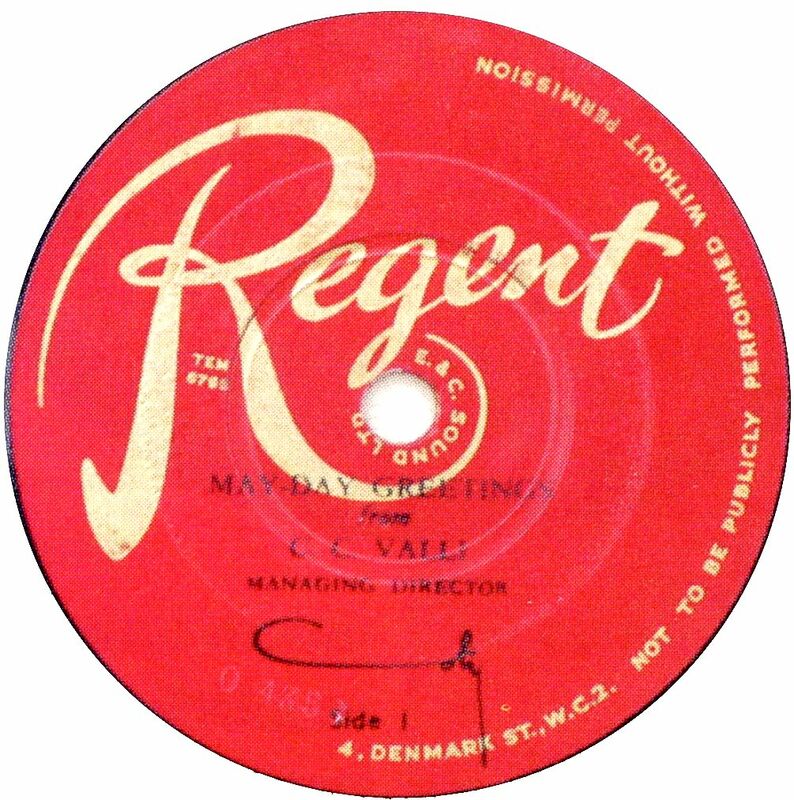 Regent Sound Studios also made recordings for the music publishers "Dix", issued on their own label. 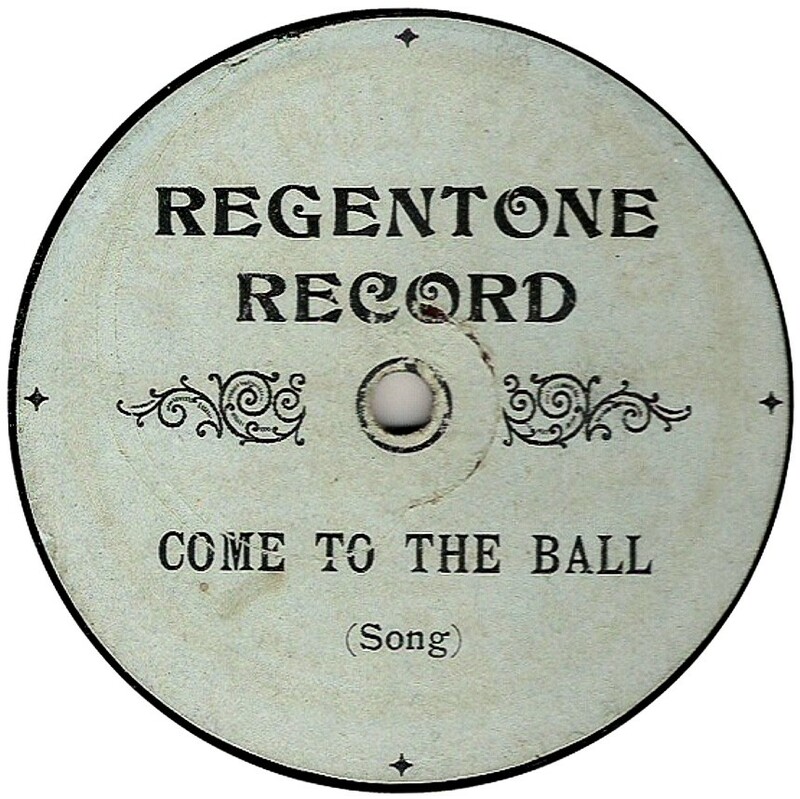 Regentone A rather anonymous label with no artist credits or catalogue numbers, Regentone records used masters also available on John Bull, taken from Beka masters. Thanks to Bill Dean-Myatt and Adam Miller, respecively, for providing the label photos. Rembrandt This label dates from pre-WWI; the example found by Frank Andrews ("For The Recored" 44) is from ARC masters of that period. The record label was owned by Henry W Bush & Co Ltd, London. From the appearance, with typewritten titling and not even a catalogue number, it may have just been pasted over an existing record such as an American blue Odeon. Rena The Rena Manufacturing Company was formed in 1908 by Louis Sterling & N. M. Rodkinson. 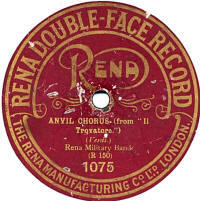 Rena records first appeared in December 1908, in both 10-" ans 12" sizes and manufactured by Columbia, using their own matrices. The label was gold-on-brown with a catalogue series starting at 1001. The Columbia matrix number was suppressed and only an R- or S- series control number shown. It is conjectured that the control prefixes may designate which recording were chosen by Sterlin and which by Rodkinson. 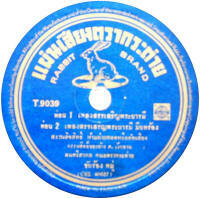 The second label design, in blue gold & white, included the trade mark of Pan playing the pipes. 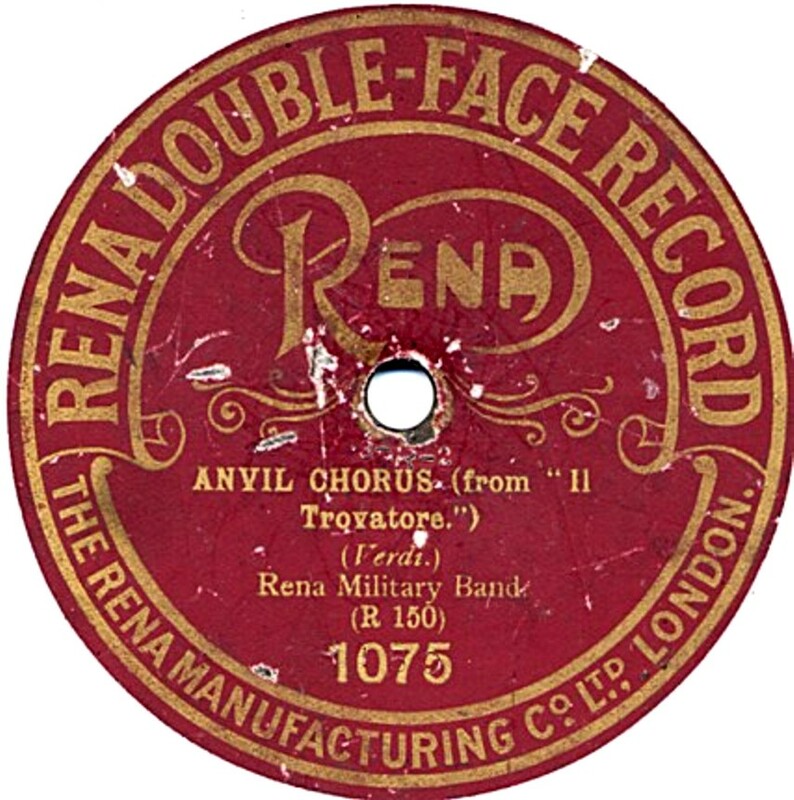 This trade mark had been registered in June 1909 to The Rena Manufacturing Co. Ltd. Rena never manufactred records, but presumably manufactured other artifacts, perhaps gramophones? The company name around the foot of the label now refers to London and Berlin (the earlier label just mentions London. 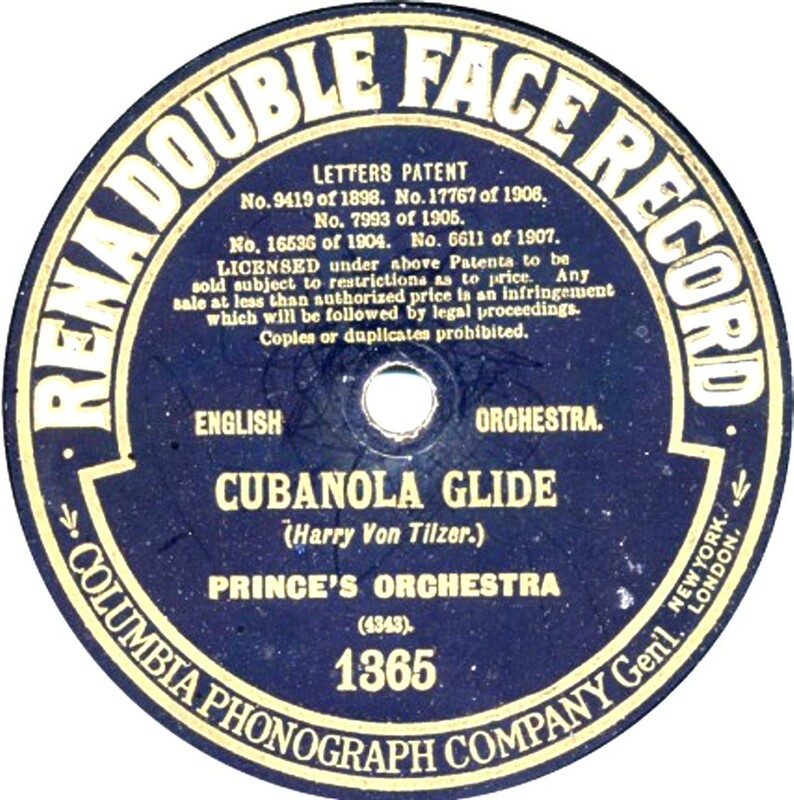 In November 1909, Columbia Phonograph Genl bought The Rena Manufacturing Company. 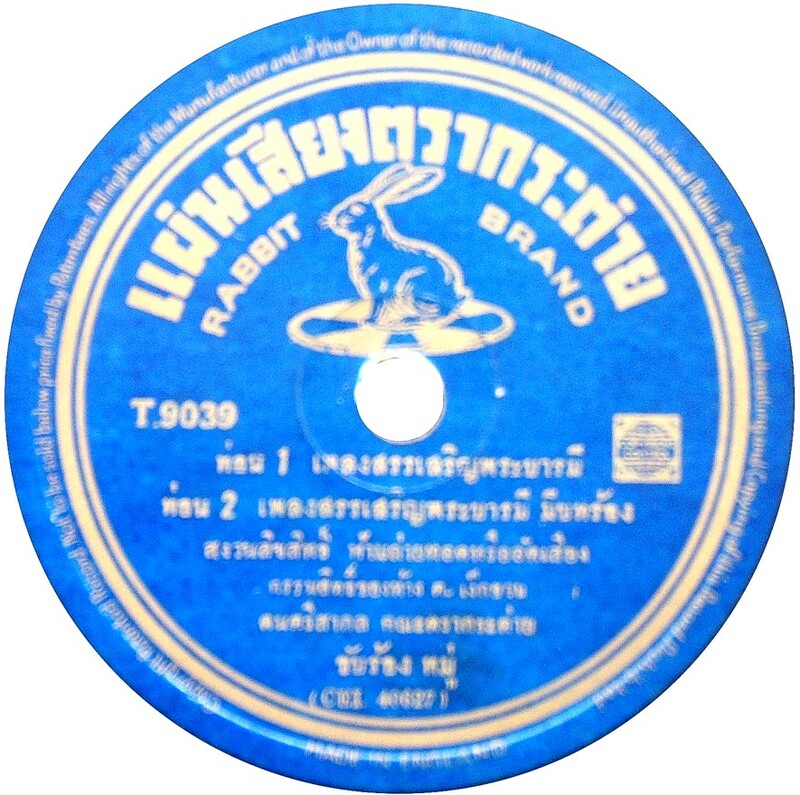 The label dropped the Pan trade mark, and in its place was text pertaining to patent and licencing. Columbia's name was also now shown around the foot of the label. In October 1910, at catalogue number 1402, the label name was changed to Columbia-Rena, with Columbia subsequently dropping the Rena part of the name In 1915, at which point the number had reached 2584. Columbia continued with the catalogue series (which had started with Rena 1001) until the end of the 1920s. Thanks to Bill-Dean-Myatt for the second label image. 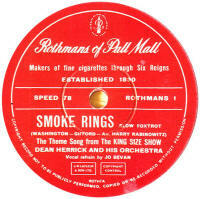 No Reno records have yet been reported, though Frank recalls seeling a Reno Record paper sleeve. It is possible, as a result of Columbia's action, that the records were recalled and destroyed. W.H. Reynolds Ltd had bought the former Disc Record Company's factory in Rosslyn Crescent, Kenton (nr Harrow) and renamed it The Reno Works. He did manufacture some records there, using a material called Renoplex, which was lighter and more flexible than the usual shellac compound used by most record manufacturers. 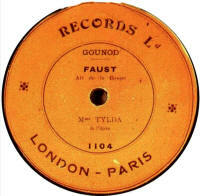 Reynolds' records used existing masters which the DRC had left at the factory, so it is likely, if any RENO records do ever turn up, that they will be pressed from masters previously the property of J. Blum & Co, who had latterly been having their records pressed by the DRC at Rosslyn Crescent. 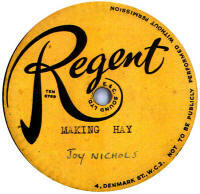 Reproduction Of A Celebrity Holt, Lees & Co, of Friday Street, Cheapside, London sold these records. 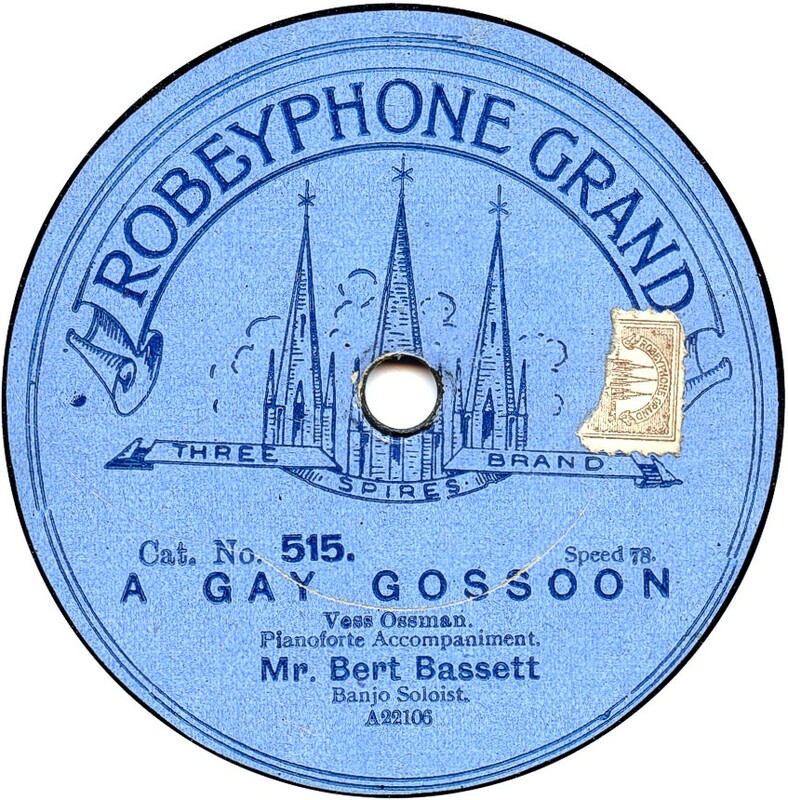 The labels were overstuck on Orpheon Record issues which were themselves pirated recordings of The Gramophone Company, Victor Talking Machine Co or British Fonotipia Ltd, manufactured in Russia. 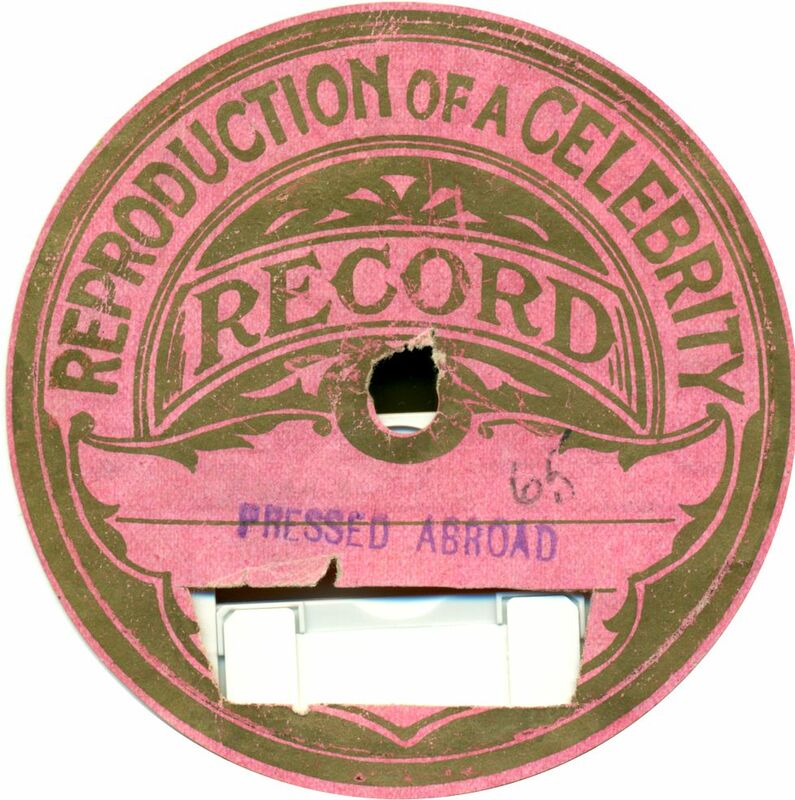 The Reporduction Of A Celebrity record label had a section cut out so that it showed the title details from the original label underneath. The Orpheon pirating business was operational from about 1906 until 1911, when the factory was raided and the plant, matrices and records confiscated. Since Holt, Lees & Co, who sold the "Reporoduction..." records, didn't start trading until 1911, it seems that they were selling the confiscated stock, maybe on behalf of The Gramophone Company? The records were 3/6 for 10", 4/6 or 27cm, and 7/6 or 8/6 for 12" and date from just before WWI. 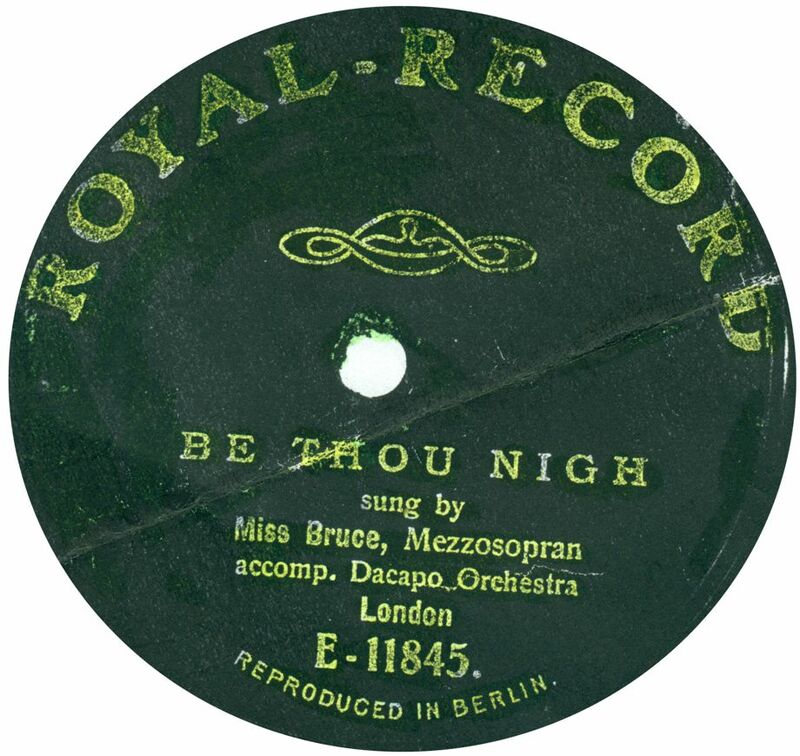 Reviera This record (and others, if there were any) was recorded & manufactured by Metropole/Piccadilly and the recording dates from about September 1931. 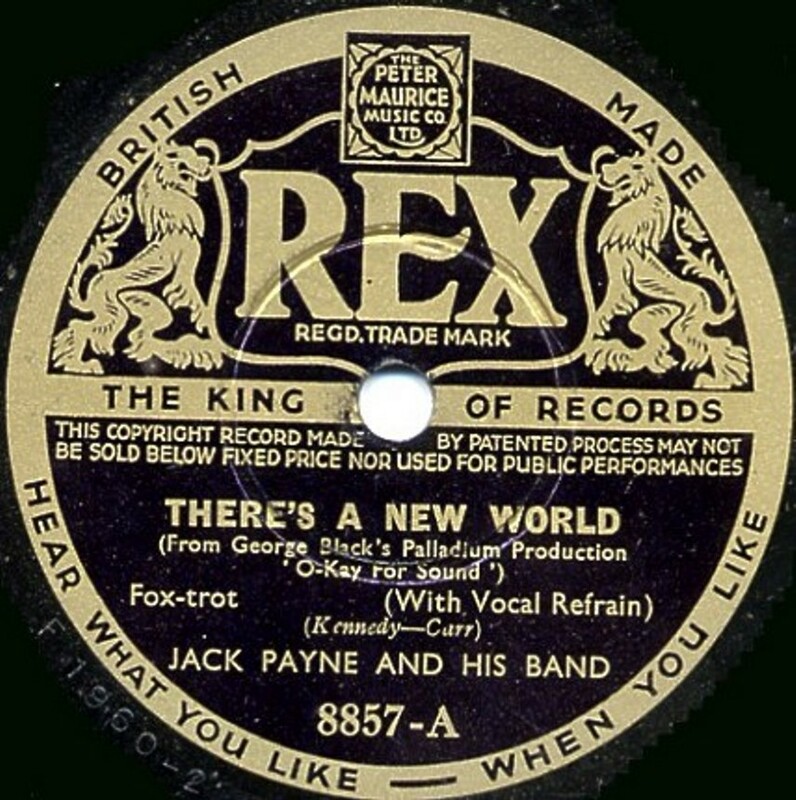 Rex Record Not to be confused with Crystalate's popular 1930s records (see below), nor with the American disc record of pre-1920, the original Rex record was a British product dating from about 1909. The label is a very plain design of red with black print, not unlike the design of the Nicole label. It was manufactured by The Disc Record Company and has their characteritic embossed "Made In England" in the area outside of the label. There were no catalogue numbers and the details on the label were minimal - just the title of the piece of music and no artist name. 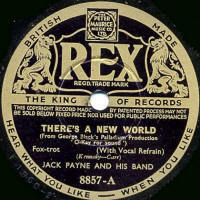 Rex "The King Of Records" first appeared in September 1933. It was a quality record at a cheap price (1/-) produced by Crystalate and sold in Marks & Spencer's stores and probably at book stalls and similiar non-record dealers. 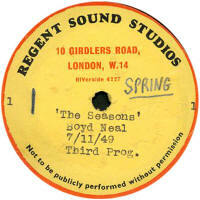 The catalogue series started at 8001, reaching over 10220 by February 1948 when the last ones appeared. An Irish series sported a suitably green label and a U-series catalogue. The matrix series started (for some reason) at F-500. 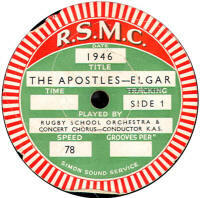 American masters from ARC were liberally used, generally under pseudonyms such as Hollywood Dance Orchestra or Ed Lloyd and his Band (for dance records). 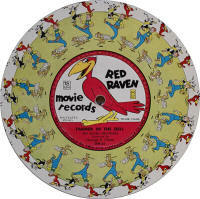 Jay Wilbur was the studio director, but top name bands were also featured, such as Jack Payne, Charlie Kunz, Billy Cotton, Brian Lawrance and Jack Simpson. In March 1937, Decca took over Crystalate and the F- matrix series changed to R- with the same numbering. I was recently (2017) sent an image of a Rex with a 60000 series catalogue (see right), about which I know nothing nor have I ever seen anything wrtitten about these. 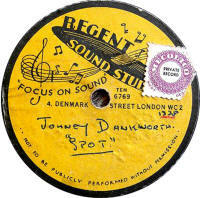 From the label design, it would appear to have been issued in the 1940s, but the recording on this particular issue is from the 1930s, recorded by Decca. 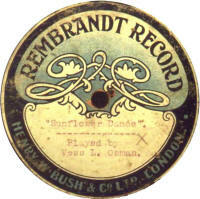 (sold in Australia) Homophone in Germany manufactured Rexophone records for the Australian market, prior to WWI. Both 10" and 12" sizes were made. The initial labels were plain green with gold printing, changing to a black label with a coloured picture (similar in style to "Winner") in 1914. Following the outbreak of WWI, Edison Bell took over production, which continued until about 1917. R.G. 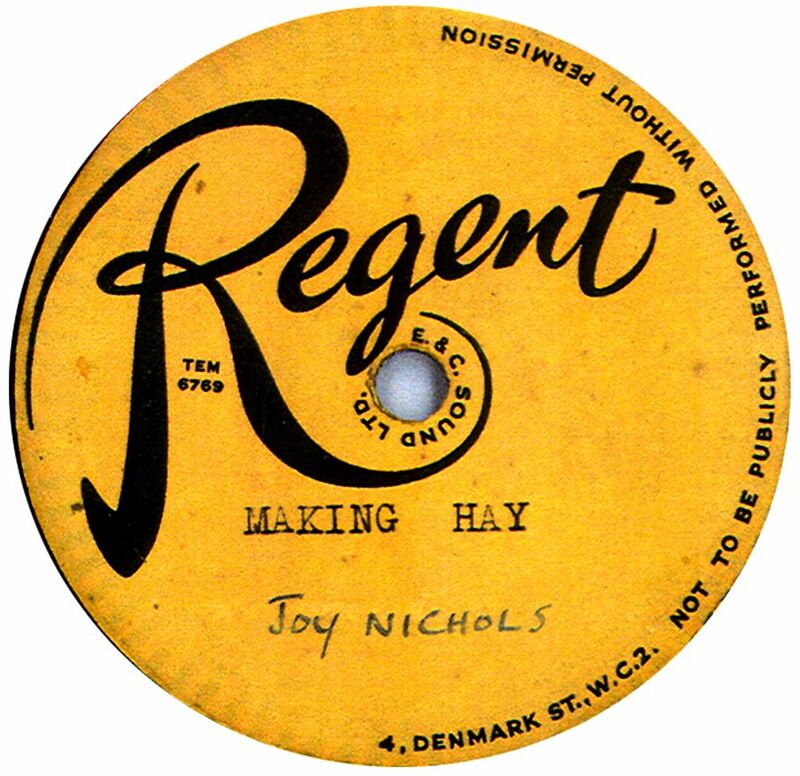 Jones Thanks to Bill-Dean-Myatt for the label image. 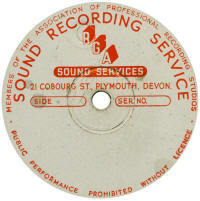 RGA Sound Services Thanks to Bill-Dean-Myatt for the label image. Rifanco The Rifanco trading name was the property of Leon Liebowich and his Regent Fitting Company, who had been using it to cover records and gramophones prior to WWI (see "Besttone" label). The Rifanco record seen here looks to be post-WWII (especially as it uses the term "Hi-Fidelity"). It may be that Liebowich was still trading and decided to start seling his own record label again. From the solitary example, it could be assumed it concentrated on Hebrew naterial. Image courtesy "For The Record" No. 46. 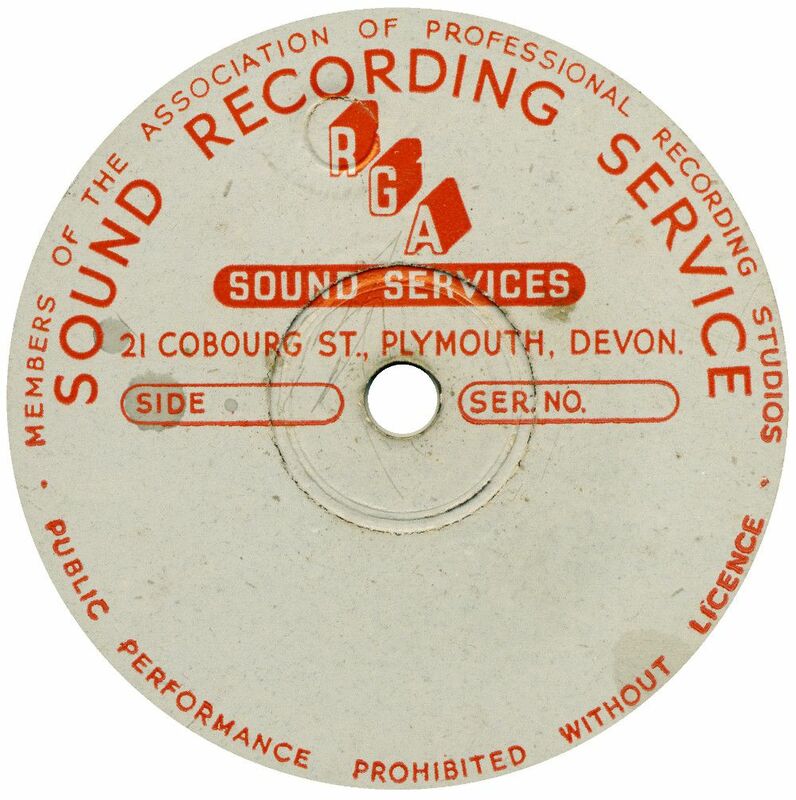 Rigby Sound System As a result, in September 1932, of the major record manufacturers trying to impose a fee on dance halls & cinemas if their records were played, new record companies started up specifically to produce records for this purpose. Mecca was, of course, a major operator of cafes, restaurants and dance halls. They decided to have their own label, and Rigby Sound Sytem started making recording for Mecca, using a "Cairns And Morrison" recording equipment. 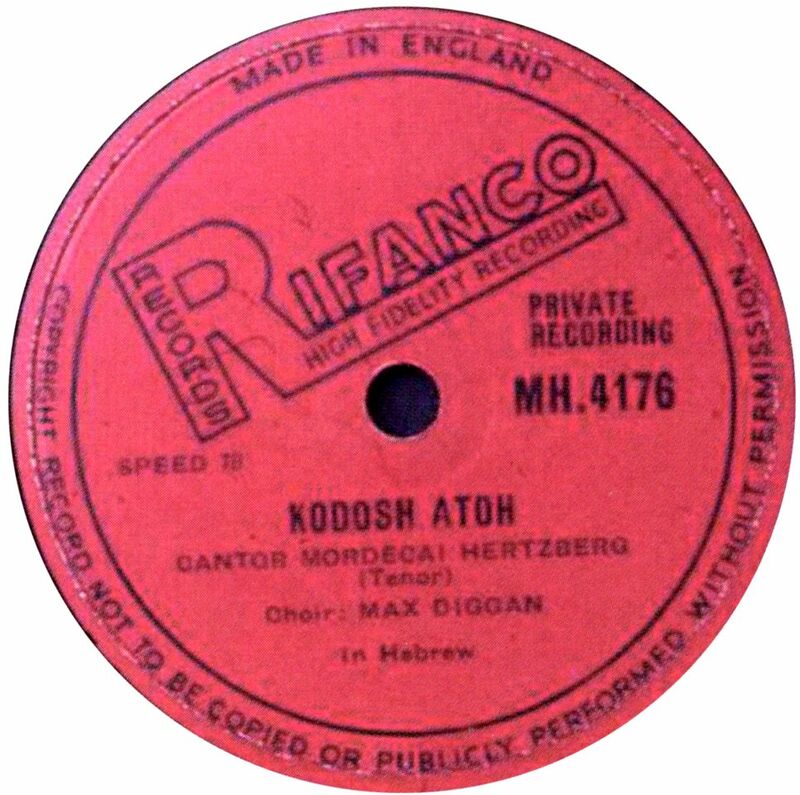 This recorded onto alloy discs, which were easier to process into proper shellac discs that the wax masters useing by most companies. However, from Frank Andrews writings in "For The Record" No. 46, I am not clear if the idea ever got past the experimental stage. Rimington, Van Wyck This well-known gramophone & record dealer in Cranbourn Street, London W.C.2 advertised in "The Gramophone" magazine in the 1930s that they offered "Unique Recordings" of unusual Classical music repertoire which would imply their own records, described as "Gramophone Music for The Connoisseur". Rimington, Van Wyck (RVW) were guilty in their advertisements of the mis-use of the word "unique" which is hugely (and incorrectly) overused nowadays. Perhaps "Exclusively available in Britain only from Rimington, Van Wyck" is a better, though long-winded, description. 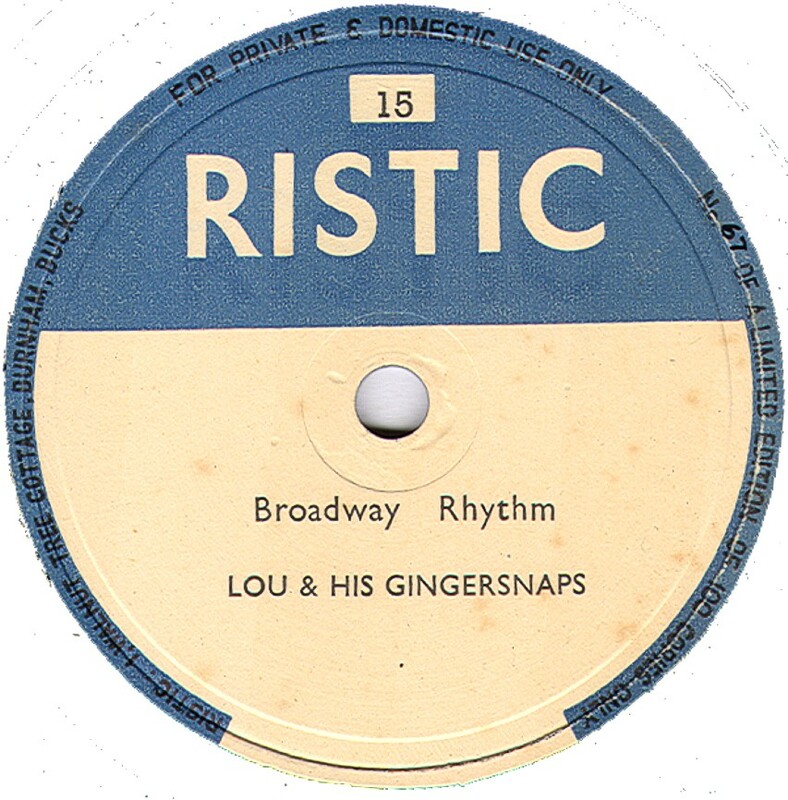 In 1949, Rimington, Van Wyck advertised records with GSC-prefixes which were recorded for The Gramophone Shop in New York and sold there as Gramophone Shop Celebrity Records, hence the prefixes. 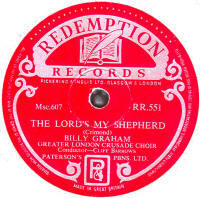 The records were recorded & made by The Gramophone Company Ltd (then part of EMI). Peter Adamson's article in "For The Record" No. 50 explains all this in more detail. Ristic Musician, sound engineer and vintage jazz enthusiast, John R.T. Davies was responsible for the Ristic issues. 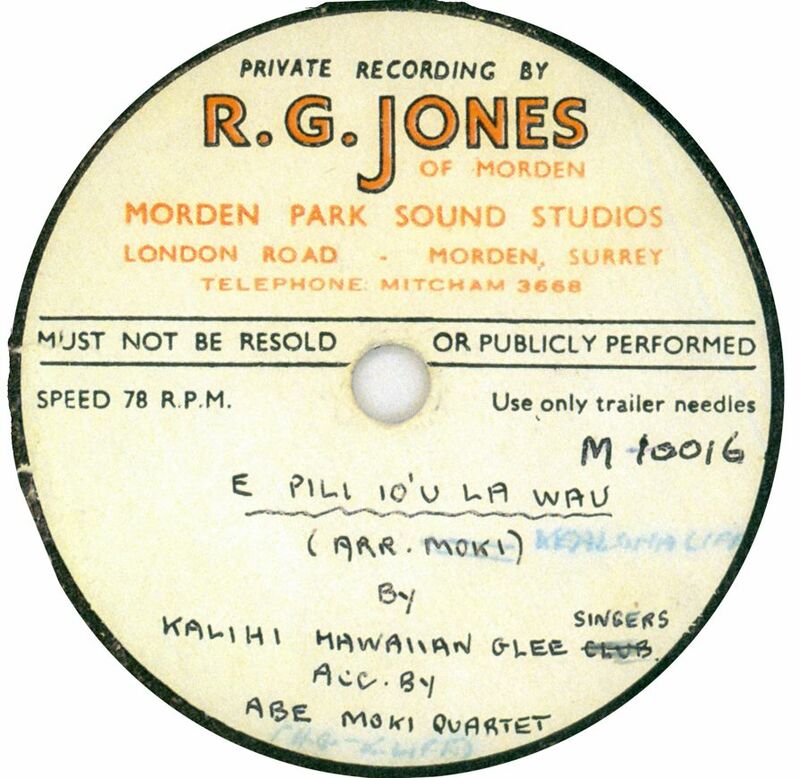 These were mainly high-quality transfers ("dubs") from extremely rare 1920s Jazz and Blues originals, plus a few new recordings by jazz bands. 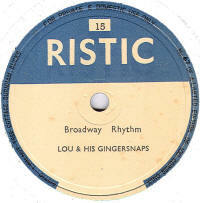 Some Ristics were 45rpm, 10", with two tracks each side. All were pressed in vinyl and only 99 copies (at most) of each issue were produced. The series started at 1, in November 1949. The name "Ristic" was John R.T's nickname as a youngster. Robert Farnon Appreciation Society These records were produced at almost randon periods between 1957 and 1968, specifically for members of the Society,and were not of general sale. Roberto This was a half-label overstuck on old Columbia-Rena records. The plain white label with black printing only covered the top half of the label, so made no attempt to hide Columbia's name around the foot of the label. It is not known who was selling these records, nor when. 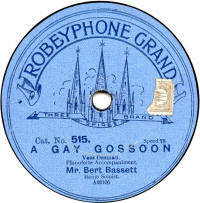 Robeyphone Robeyphone Grand records were sold by George. T. Robey of Coventry along with Gramophones of the same make and needles. "George Robey" (no connection with the music hall comedian) was the trading name of Mrs Ada O'Brien. The trading name changed, in 1913, to Chas. T. Robey, probably due to the music hall comedian lodging a complaint about misuse of his name. 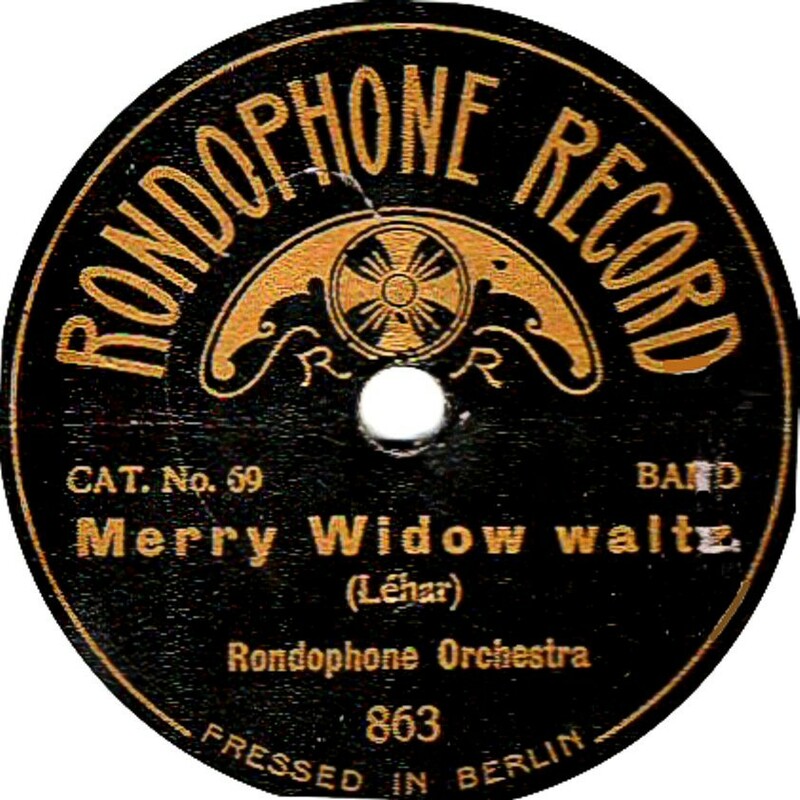 The Robeyphone Grand records were introduced in late 1908 and used "Jumbo" (i.e. Odeon) masters in the Lxo- series. Made in Germany by Homophon, for the Australian market, these records date from immediately before WWI. Please e-mail me with details of ANY of these records. Thanks to Adam Miller for providing the label scan. Ronnie Engineering This may not even come intyo the realms of a record label or recording Company, so may not be approprsiate here. 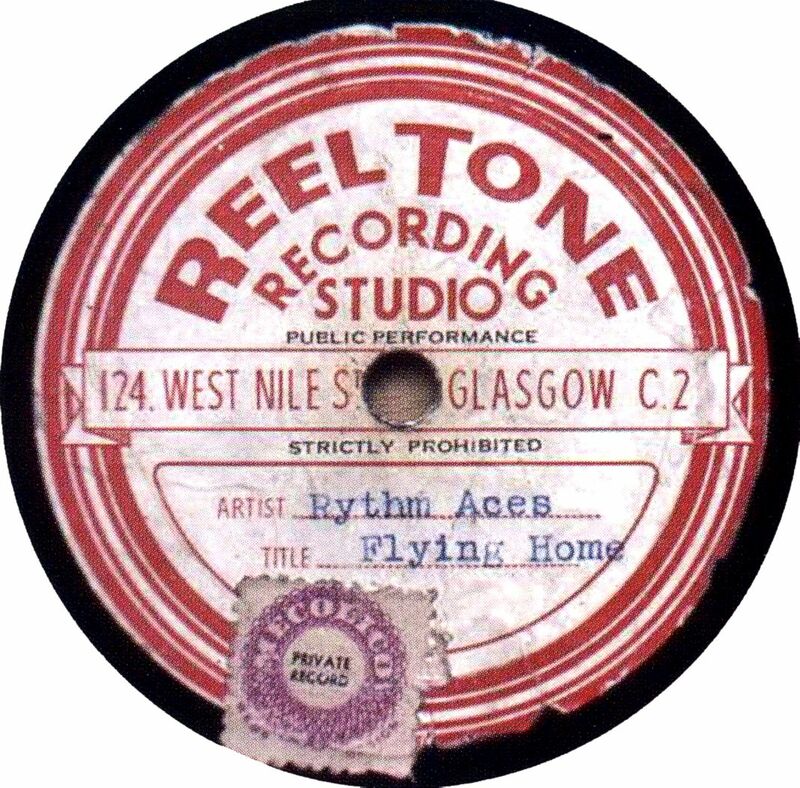 Ronnie Engineering of Crewsdon Road London SW8 advertised a home recording system, recording onto metal blank discs. The system cost 20 or 25 guineas. 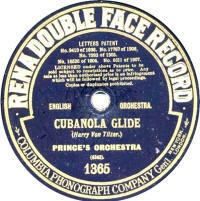 (sold in Australia) This was a paste-over label on old stock of Columbia & Regal records, sold in Australia. Ross Record Rather unusually, there is no proprietor's name or locatin shown on the label. 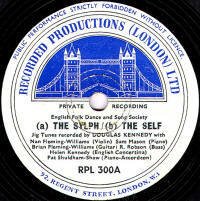 The image is pf a blank unused label, so I have no idea what type of record was being used, though the instruction to use lightweight pickup would probably imply a lacquer disc. Rothmans This may well have been a one-off issue for the famous cigarette maker. 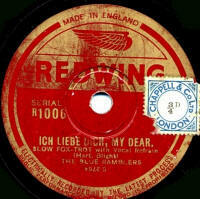 The tune dates from the early 1930s, but it seem likely the record is post WWII. There were two or three different ROYAL records available in Britian during the period before World War I. 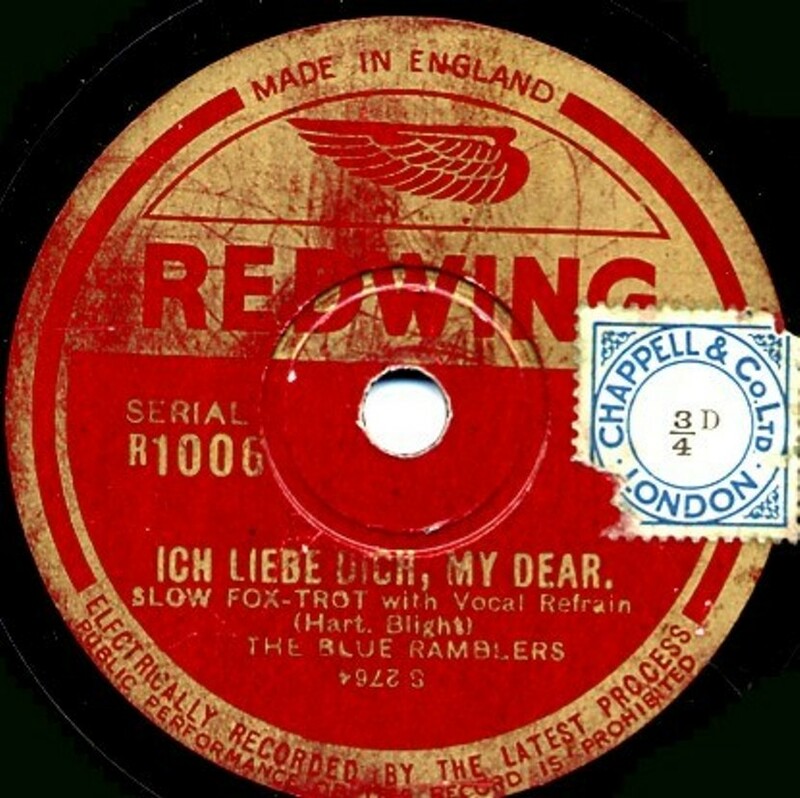 The first dates from about 1906-07 and was made by The Disc Record Company of Stockport, Cheshire, using old Nicole masters, which the DRC owned following Nicole's collapse in 1906. I don't know what size these were (7" or 10" or both) nor whether they were made from the Nicole-style unbreakable material, or standard shellac as I've never seen one, or even an image of one. Can anyone help? The second dates from 1908, and was made in France and exported to Britain. 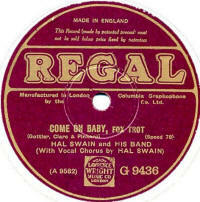 Originally due to be called Eden Record, when they were announced in September 1908, they were styled ROYAL. It was 10½" in diameter and cost 2/6, manufactured by the International Phonique Company in France - that is if it ever happened, because no one has reported the physical existence of any records of this style! 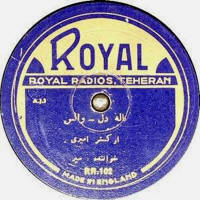 In later years there was another Royal label (see image) which was made in England for export to Teheran. I've no idea of the date. Thanks to Rainer Lotz for providing the label image for this style (who apologises for the poor quality). 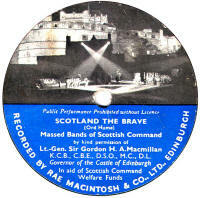 These were recorded by EMI in late 1941 and put on sale at the start of 1942. 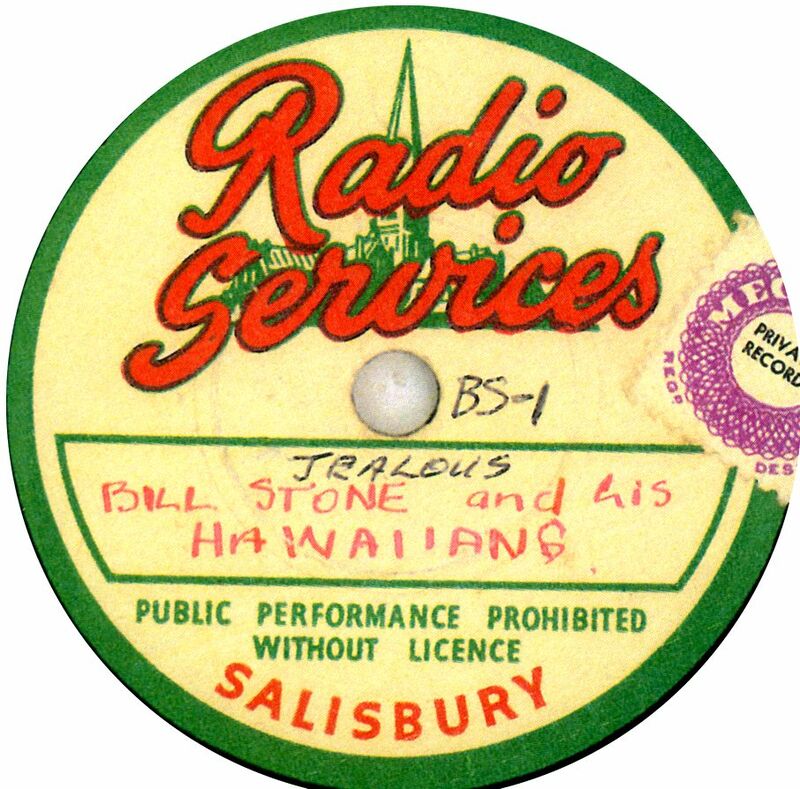 Royal Standard Frank Andrews reported an seeing an image of a paper bag with "Royal Standard - Best British Record on the market for Instrumental music" printed on it, but had never seen an actual record. RSCM Thanks to Bill Dean-Myatt for providing the label image. 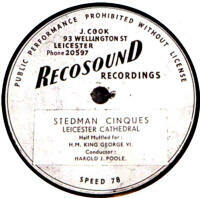 RSMC This label was produced by Simon Sound Service of Rugby, Warwickshire. 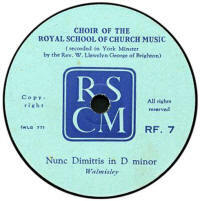 The example is dated 1948 and would seem to be a specially produced record for The Rugby School Music Club (RSMC). Rubin A German-produced (by Homophone) label exported to Britain prior to WWI. 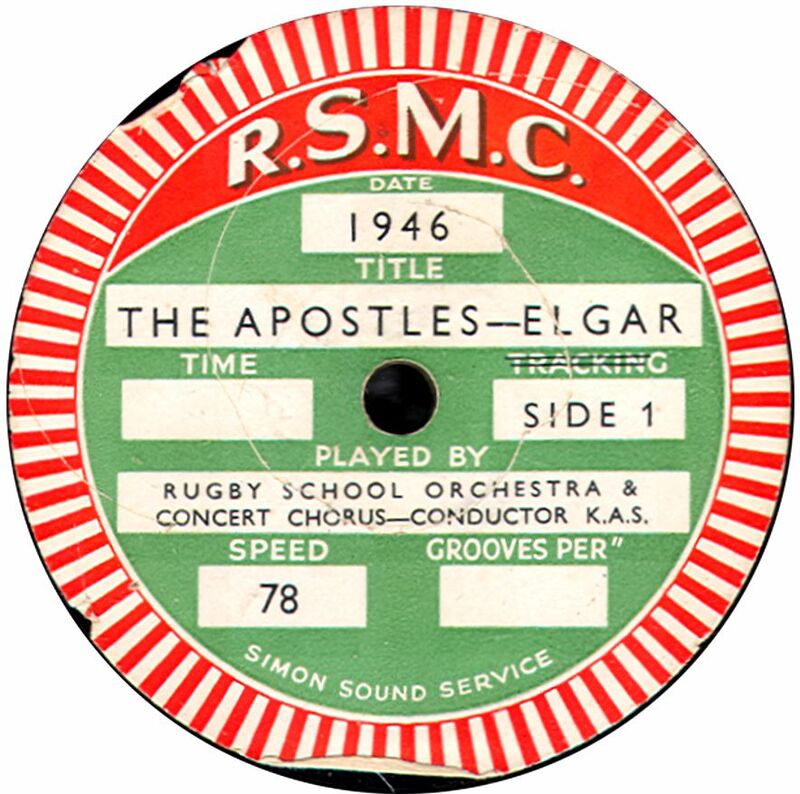 There are two versions of the label, but the English-titled ones use a catalogue series in the E-1 range. Russell An very rare label, only in production for 3 or 4 months during late summer 1908. It was made by F.M. Russell & Co Ltd, of The Junction Works, Willesden, London. 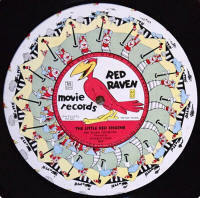 There were only eighteen 10" and fifteen 12" discs altogether and few people have seen them since ! The 10" discs (costing 3/-) had an A-prefixed catalogue number, and the 12" ones (at 5/6) a B-series.